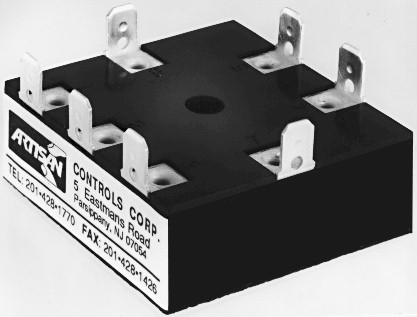 The model 439 is an all solid state delay-on-make timing module operating a set of relay contacts as the output. When operating voltage is applied the timing period begins. At the end of the delay period, provided by an external resistor. The timer is protected by transient absorption devices that provide for a highly reliable timing device when used in high electrical transient applications. Operating Voltage 24, 115, 230V AC, 5060Hz. Tolerance - 10%. Operating Current 50 milliamperes maximum. Output Rating ULCSA rated 5 amperes, 16HP 125V-250V AC. Timing Range Fixed units available from 30-600 seconds, adjustable from 30-600 utilizing a timing resistor from 0 to 1 meg ohm. Repeatability Of Timing Periods +/- 2% nominal. Operating Temperature -20 C to 85 C.